China’s Ant Financial Services Group created the world’s largest money-market fund in just a few years before being forced to scale it back. Now, it is worried about losing too many investors. Ant’s flagship money-market fund, Tianhong Yu’e Bao, shrank by more than a third last year after Chinese regulators became concerned about its size and potential risk to the country’s financial system. The fund’s assets under management fell to 1.13 trillion yuan ($167 billion) at the end of 2018 from 1.69 trillion yuan in March, according to data provider Wind Information Co. The giant fund had grown rapidly since its founding in 2013 by drawing from the spare online cash of hundreds of millions of Chinese citizens who used Ant’s Alipay mobile-payment network. To control its size, the fund’s manager imposed caps on inflows and lowered returns by reducing its holdings of hard-to-sell assets. And last year, Ant also added a dozen money-market funds from other asset managers to its online wealth-management platform to give customers other investing options. Then its rival appeared on the scene. Tencent Holdings Ltd. , which owns China’s other giant mobile payments network—WeChat Pay—last fall began offering a select group of users the opportunity to invest their spare cash in online money-market funds similar to Ant’s Yu’e Bao, which translates to “leftover treasure” in Chinese. In China, online money-market funds operate much like interest-bearing checking accounts, allowing people to invest small amounts of cash for short periods and withdraw money for everyday spending without transaction fees. Tencent’s new product, called LingQianTong—or Mini Fund—quickly began drawing funds from WeChat Pay users. 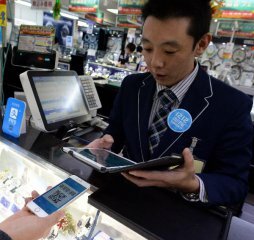 In many cases, these users also utilize Ant’s Alipay mobile payments network. Ant’s flagship Tianhong Yu’e Bao fund was recently offering an annualized investment yield of 2.63%, slightly lower than yields on about a dozen other money-market funds on its Yu’e Bao investment platform. In comparison, yields on money-market funds available on Tencent’s LingQianTong ranged from 2.84% to 3.78%. Following Tencent’s rollout, Ant employees and external managers of money-market funds on the Yu’e Bao platform were told to keep their yields competitive with rivals, according to a person familiar with the matter. A Tencent spokeswoman declined to disclose how much cash has gone into the money-market funds since LingQianTong’s rollout. Hangzhou-based Ant, which was spun out of Alibaba Group Holding Ltd. and last year became the world’s most valuable private technology startup, is trying to strike a balance between its growth ambitions and the need to placate regulators who have become uneasy about its size and influence. Chinese authorities have been trying to tighten supervision of Ant and other fast-growing financial technology companies that handle large amounts of money but aren’t as tightly regulated as banks. By selling investment funds online and letting people buy into them using mobile apps, Ant and Tencent have reshaped China’s 13 trillion yuan ($1.9 trillion) mutual-fund industry in recent years. The funds they sell comprised nearly a fifth of the industry’s assets under management in 2018, up from just 6% five years earlier. Over this period, the industry has more than quadrupled in size, according to data from China Galaxy Securities Co.
George Xu, an analyst at Moody’s Investors Service, said the days of uncontrolled growth in China’s money-market fund industry are likely over. However, competition between Ant and Tencent to offer higher-yielding funds to individual investors could lead to more risk taking by the money-market funds, he said. It could also lead to large fund inflows and outflows if many investors decide to switch their money from one product to another in search of better returns, Mr. Xu said. In a worst-case scenario, a fund might encounter liquidity problems if it can’t sell assets quickly to meet withdrawals. Ant’s Yu’e Bao money-market platform has more than 600 million users, while more than 150 million investors have bought various wealth-management products offered through Tencent’s WeChat. Chinese regulators have been watching Ant’s flagship Tianhong Yu’e Bao fund closely and recently sounded warnings about its potential risks. In November, the country’s central bank warned in an annual financial stability report that an unnamed large money-market fund could jeopardize the stability of the entire financial system—and society as a whole. Because so many people have invested in the fund, any problems it might have repaying investors could spark public anger and protests. Industry participants believe the People’s Bank of China was referring to Ant’s Tianhong Yu’e Bao fund. The other issue with online money-market funds in China is that they mimic how bank accounts work but they don’t have to set aside a portion of their assets for reserves and aren’t subject to bank capital requirements, the report also noted. Their higher returns—often achieved by holding assets like bank-issued commercial paper—have enabled their rapid growth, the report also said. Ant’s Tianhong Asset Management unit has spent much of the past 18 months trying to appease regulators by de-risking its giant fund’s portfolio, moving more of its money into more liquid and lower-yielding assets like short-term government debt. Tianhong also put caps on how much people can invest in or withdraw from the fund daily, in an effort to prevent mass redemptions in the event of a financial panic.